The board of selectmen discuss potential uses for approval on the Ox Ridge property acquired last year at Darien town hall on Jan. 23, 2018. 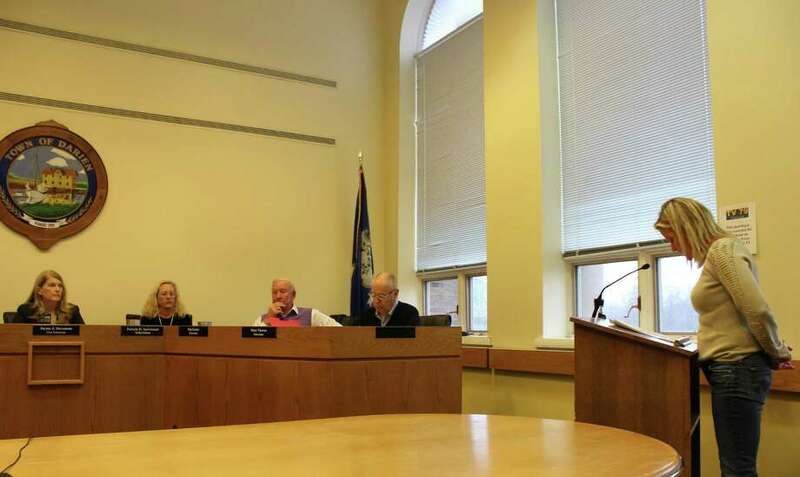 DARIEN — Saying an 8:45 a.m. Tuesday meeting would not involve sufficient public comment or discussion, the Board of Selectmen pushed a vote on the possible uses for the 16-acre Ox Ridge property to Jan. 29. A main topic of discussion on Tuesday was the permitted number of events that would be held at the property. As of now, 10 town-sponsored and five-nonprofit sponsored events have been recommended, with the former prioritized over the latter, though the number is not finalized. “We’re not saying there will actually be 10 events but that there can be no more than 10 events,” Selectman Susan Marks said. Like at many meetings regarding the Ox Ridge property and the Parks and Recreation Commission’s parks master plan, the debate about preserving open space was brought up. “Our goal is to provide the constructs with which Parks and Recreation will be allowed to program the space. It’s equally important that we have both passive recreation always available while programmed activities take place on parcels of the property,” First Selectman Jayme Stevenson said. Two Darien residents voiced their hope that the Ox Ridge property be left as an open space for passive recreational use. Stevenson countered, saying the state’s definition of open space was subject to interpretation and the Representative Town Meeting had approved a $6.2 million purchase of the property so it could be fully utilized by the community. Selectman Kip Koons reiterated that his position as a financial consultant for the Ox Ridge Hunt Club since last November would lead him to abstain from voting on the Ox Ridge decision. He did, however, contribute to discussion. All currently permitted uses, such as passive recreation, use of athletic fields and required parking ancillary to fields, will remain, regardless if the Board of Selectmen approves additional uses. Once any additional approved uses are voted through, these would be translated into a special permit application that would be reviewed by the Planning and Zoning Commission, a process that could take months. The special permit would give the Parks and Recreation Department the ability to monitor and schedule activities and events on the Ox Ridge property. “We put together a special permit and the Planning and Zoning Commission, depending on how busy they are, will have to approve a mandatory referral and then a special application,” Stevenson said. When Stevenson asked what activities would be viable at 7 a.m., Pam Gery, the parks and recreation director, responded that there were various popular, early-morning exercise programs. The Board of Selectmen at a previous meeting on the Ox Ridge property stated that no lights and no turf fields would be implemented. A study to analyze the possible up-swell in traffic in the area and the possible addition of a one-story building as a restroom station were also discussed. Board of Selectmen meetings are typically scheduled for Monday evenings. According to Stevenson, Tuesday’s 8:45 a.m. meeting was scheduled in an effort to combine the discussion of the Ox Ridge property and a quarterly meeting with department heads.